Natural processes are interactions among plants, animals, and the environment that help create and shape natural communities . Some important natural processes in Rock Creek Park include natural disturbances such as flooding and fire, herbivory by white-tailed deer, erosion and sediment transport by streams and stormwater runoff, and groundwater processes . Natural processes (also known as ecological processes) are interactions among plants, animals, and the environment that occur naturally (without purposeful intervention by people). They are just as critical to the identity of natural communities as are the plants and animals that make up the communities. They also help maintain the health of natural communities. Let’s look more closely at a few natural processes that are particularly important for understanding the natural communities we see at Rock Creek Park today. These are just a tiny fraction of all the natural processes busy at work, noticed or unnoticed, shaping natural communities. Fire is a natural disturbance that can help maintain dry hilltop communities, such as Rock Creek Park's Chestnut Oak / Mountain Laurel Forest and Mixed Oak / Heath Forest by weeding out plant species that won't survive fire over the long term, as well as by weeding out diseased vegetation. Another natural disturbance, flooding, is important for maintaining the Tuliptree Small-Stream Floodplain Forest. This community’s plant species, such as American sycamore and river birch, thrive through frequent flooding that might kill a dry-adapted chestnut oak. A gap in the forest canopy admits sunlight beneficial to young oak saplings . Photographer: Tom Paradis, courtesy of CUE, NPS. Inset (white oak) – Erin Lunsford Jones.An important natural disturbance in forests is the creation of gaps in the canopy when large trees fall due to diseases or storms. Seedlings and saplings on the forest floor take advantage of the newly available sunlight to grow and join the canopy. Herbivory is the consumption of plants by animals (including insects). It's an important part of what keeps plant populations at Rock Creek Park from exploding! What would the park look like if every single seed produced there grew up to be a full-sized plant? Erosion and sedimentation are most evident in the Tuliptree Small-Stream Floodplain Forest in Rock Creek Park. However, sediments creep or slide downslope in in other areas as well. For examples, ancient river gravels on ridgetops gradually move downhill, affecting the soils in natural communities downslope. Soil itself also washes downslope, leading to thinner soils on steeper slopes and thicker soils on flatter or concave landforms. Many natural processes in Rock Creek Park interact to determine soil characteristics, such as depth, moisture content, composition, and texture. These characteristics, in turn, determine where different natural communities can be found. Soil moisture is an obvious factor in determining what plants can grow where. On ridgetops and upper slopes in Rock Creek Park, exposure to sun and wind create dry soils that support the Chestnut Oak / Mountain Laurel Forest and Mixed Oak / Heath Forest. The Mesic Mixed Hardwood Forest, on the other hand, grows in soil that is mesic—not too wet, not too dry. Mesic soils tend to be found in areas protected from extremes in climate, such as lower slopes and rolling uplands . The Coastal Plain Oak Forest and the Basic Mesic Hardwood Forest also occur on mesic soils. In the lower elevations of the park, along Rock Creek and its tributaries or at the base of hills, you’ll find natural communities growing in soils that can be quite wet, with the moisture being supplied by groundwater or floods. These wetland communities are the Tuliptree Small-Stream Floodplain Forest and the Red Maple Seepage Swamp. The depth of soil varies across the park as well. The Oak – Beech / Heath Forest survives on steep slopes where erosion and gravity prevent much soil from accumulating. In contrast, the Basic Mesic Hardwood Forest is found in areas with deep accumulations of soils, such as concave slopes. Furthermore, the composition of the soils that support the Basic Mesic Hardwood Forest are relatively rich compared to other soils in the park. The nutrients of these rich soils may be supplied by the mineral composition of underlying bedrock or sediments, or nearby nutrient-rich groundwater. 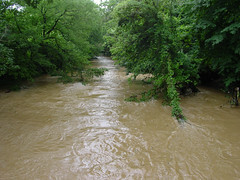 Rock Creek's frequent floods impact the Tuliptree Small-Stream Floodplain Forest. Photographer: Ryan ValdezRock Creek Park’s streams, tributaries, springs, and groundwater seeps are all part of the water cycle, which plays a central role in Rock Creek Park’s natural communities. The Red Maple Seepage Swamp and Tuliptree Small-Stream Floodplain Forest depend on a steady source of water, whether from groundwater or flooding. Less water cycles through the high and dry Chestnut Oak / Mountain Laurel Forest and Mixed Oak / Heath Forest, and that water comes mostly in the form of precipitation rather than flooding or groundwater. Prior to the formation of the park in 1890, much of the land that became Rock Creek Park had been recently disturbed by logging, farming/orchard planting, and Civil War clear-cutting . Map tip: To find the Civil War forts closest to Rock Creek, search for "fort" on the interactive map of Rock Creek Park and select results under Historic Sites. Most of these areas have had many years to recover, and may look like they've been there always, but the composition of these forests tells us that they have grown up on sites that were formerly cleared. These are called successional forests. Successional forests contain clues that can indicate whether the area was logged or whether it experienced more extreme disruption, such as plowing or earth-moving. However, it’s not always possible to accurately guess a piece of land’s history strictly by reading the current forest growth. For example, at Fort DeRussy today, we see mature chestnut oak and northern red oak trees, and very little else. A typical natural community would have a better-developed understory . A typical successional community would be made up of mostly non-oaks. We don’t know the precise history of the vegetation at Fort DeRussy that led to this anomalous combination. Any number of unknown variables (in this case probably human-induced ones) may have impacted the site during and since its clearing. 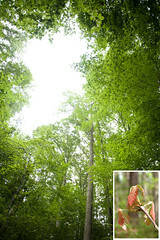 Learn about Rock Creek Park's successional forests. Rock Creek Park deals with stewardship challenges related to several of these natural processes. See Stewardship and Ecological Threats at Rock Creek Park. Ever since urbanization spread around the park in the 1900's, fires have needed to be suppressed. Read about the impact of fire suppression on Rock Creek Park's driest hilltop natural communities and historic meadows, and the ways natural resource managers are trying to simulate the historic benefits of fire, in Current Water and Land Use | Fire Suppression. Urbanization has interrupted several natural processes by routing stormwater runoff from streets directly into creeks. Read about the stewardship challenges that arise at Rock Creek Park in the areas of flooding, erosion, soil processes, and water cycling (as less water can soak into the ground and make its way to the creek as groundwater, and more water is directed to flow through the Rock Creek stream channel), in Current Water and Land Use | Water Issues. Population explosions of white-tailed deer and non-native invasive insects such as gypsy moth can take the natural process of herbivory to destructive lengths! Read about these threats and the park natural resource managers' response to them, in Population Dynamics and Non-Native Invasive Insects. Extreme summer or winter storms can create extensive holes in forests (rather than limited canopy gaps). Read about the special challenges this creates in modern times for forest succession at Rock Creek Park, in Climate and Weather | Severe Natural Disturbances. 1. Fleming GP. 2007. Ecological communities of the Potomac Gorge in Virginia: composition, floristics, and environmental dynamics.